Equipped with sound knowledge of colocation, you already grasp the potential behind its capability of providing space, power supplies and cooling. Colocation also improves physical safety of servers, mass storage and network devices of third parties, and furthermore links them with different providers of telecommunication and network services – all this at a minimum cost and complexity. Most suppliers of colocation solutions market their products to a wide audience, the one that includes both large and small-scale enterprises. Nine times out of ten, a customer owns the IT equipment, but it is the external company that arranges the electricity, sufficient bandwidth and efficient room ventilation. By placing their servers in a data center, clients gain at least several instant advantages. Firstly, they make substantial savings on the expenses arising out of the servers management, cutting the often excruciating costs of the Internet connection, rack mounting, cables, the main and backup power supplies, etc. A greater level of network capacity secured by a data center is sure to find its reflection in more rapid access to the customers’ websites. Secondly, clients are offered the sought-after opportunity to save time – we all agree that every minute is worth its weight in gold in business – and focus closely on daily undertakings, while the staff of a data center keeps servers in peak condition 24/7. Customers can therefore maintain effective control over the complex designing process and use of their own infrastructure, whereas the daily operation of a data center is supervised by the colocation provider for multiple tenants. If you are up to speed with the latest series of colocation-exploring Blog articles, discussing the subject of fundamentals, traffic aggregation and power usage, you already know how to create a colocation in EasyDCIM, assign an unlimited number of servers to it, and also configure the PDU devices as a part of a colocation service. This product considered as a whole is appropriately arranged in the system so as to be easily ordered and later on handled by the end customer. 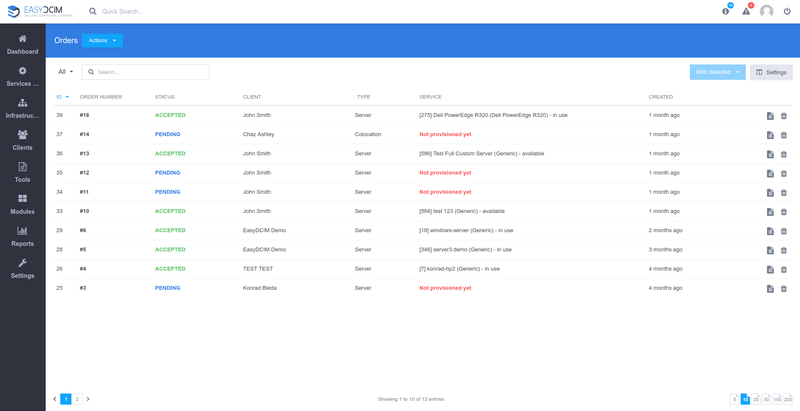 EasyDCIM provides a simple means for managing orders and services in the administrator panel. To trace essential details on existing orders, enter the „Clients” section, and afterward proceed to the „Orders” subsection located in the left menu. The orders list view features all information you may find useful, including the number, type and status of an order, a client for whom the order has been placed, as well as the service that was created in the process of order acceptance. If you would like to create a new order, choose the „Add Order” option available in the upper menu named „Actions”. You will be then automatically redirected to further steps of order placing. The „Basic Details” stage requires you to choose the type of a service that you wish to obtain. Currently, EasyDCIM supports two service categories, i.e. Server and Colocation. Together with this, choose the customer who shall own the ordered colocation service. The next step, “Service Criteria” allows you to specify the model of the colocation you would like to order as well as its preferable location. Whenever you are ready, use the designated section in your EasyDCIM panel to create a new model and a new location. We are almost there! “Service Configuration” is the final step of your order. Here you can create a colocation label that will help you locate this colocation in the future quick and easy. This is the stage at which you also select the “Access Level”, that is a set of prearranged permissions for end customers. Wait a moment, what levels? Where do I create them? Follow us! Go to the “Access Levels” section and simply pick the elements to which your clients should have access from the client area in your EasyDCIM panel, and which ones will remain off limits to them. If the colocation matching all requirements is found in the system, you will see it in the order summary view (as shown on the “Order Preview” widget). Otherwise, you will receive an appropriate notification and the colocation will have to be selected and assigned to the order manually. And voilà – a new colocation has been created and assigned to the client successfully. Now they will be able to manage its essential components directly from the EasyDCIM client area. This includes controlling transfer consumption as well as power usage of the devices assigned to the colocation, and managing power outlets by end clients remotely via “on”, “off” and “restart” options. The very same actions can be performed by the colocation owner from the “Outlets” section. 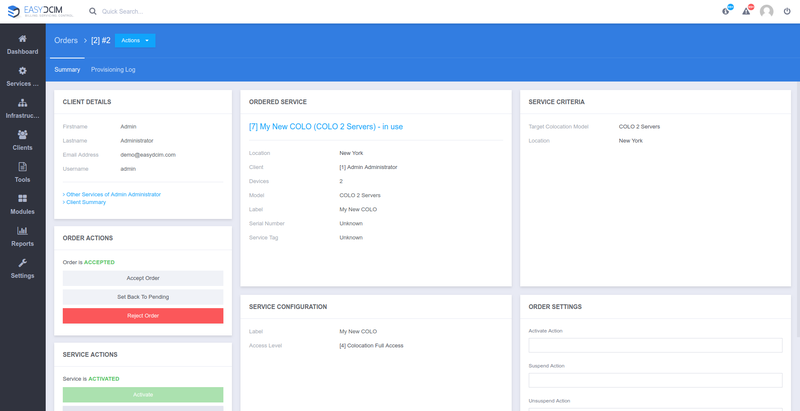 Based on the collected data and using the appropriate billing system like WHMCS and EasyDCIM Colocation For WHMCS module, the administrator can then charge customers based on their total resource consumption. The integration with the WHMCS billing system will be described in greater detail in the next article devoted to colocation. It goes without saying that the major part of the whole colocation ordering process takes place automatically and your job boils down to, basically, making a few clicks. 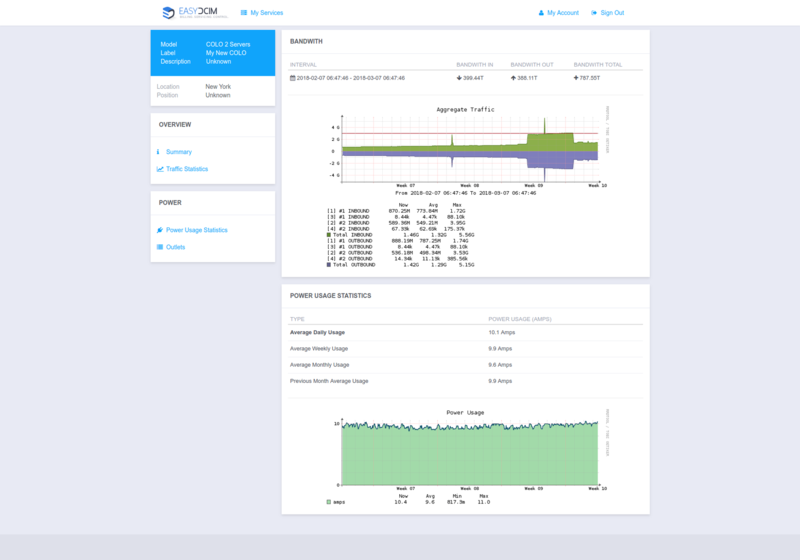 Effortless, time-effective, and fun – this is how colocation management in EasyDCIM v1.4.3 is bound to be! Master the Arcana of Colocation! Got to the end of the article, but still feeling slightly out of place? You must have somehow missed the introduction of colocation, basics of traffic aggregation and power usage tutorial! Colocation – Let’s Talk About Power Usage! Get Hooked On New Billing Perspectives!